How to save passwords? It becomes hard to remember unique passwords when you have more than 15 different accounts, which you use every day. However, when you try to write them down you can lose them even more easily, than forgetting them. Storing passwords in one file is too dangerous, because criminals can steal your entire passwords database in one turn. The best way for saving passwords is to use special password manager software Handy Password. It is easy-to-use even for novice PC user and allows you to save and storage passwords automatically in secure encrypted database. With this save passwords program, you don’t have to remember passwords. Handy Password will do it for you and will fill passwords automatically when you go to your account. On your local PC, where your passwords will be completely protected from unauthorized access. 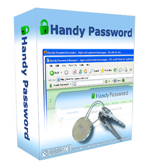 Handy Password manager works as a toolbar for Internet Explorer and Mozilla Firefox. Moreover, program is stable with different operating system settings under Windows 7/Vista/XP/2000. With Handy Password, it will not be a problem how to save passwords.